Mauritius - 18 April 2019: Deep in the fern-filled forests of Bel Ombre Nature Reserve; tucked into the bamboo groves next to the meandering Jacotier river, adventurers will be surprised to find two treetop pods have appeared, floating eerily above the forest floor. 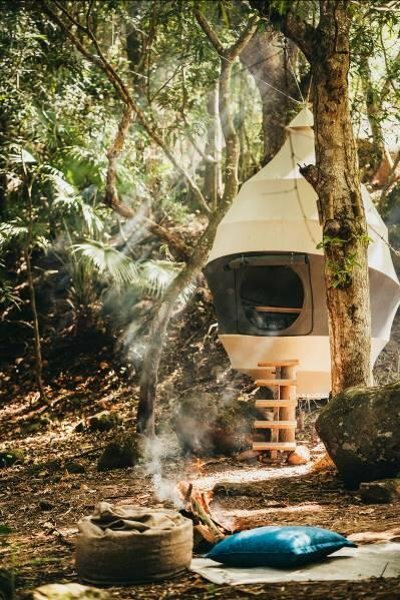 The Seedpod is the latest treehouse initiative from award-winning hospitality design company Nomadic Resorts. The pods were originally developed as a pop-up resort concept – a unique opportunity for guests to sleep outdoors and reconnect with Mother Nature without compromising their creature comforts. At Bel Ombre the concept was adapted for Heritage Nature Reserve to create a unique picnic experience. Visitors to the reserve learn about the endemic forest, have a dip in one of the natural pools, relax in a hammock near the campfire and then have a mosquito free lunch in the Seedpod. The pods are the fruit of years of research. Louis Thompson, CEO of Nomadic Resorts explains: "Our goal was to take inspiration from the humble seed, to create a floating hotel room that was both ephemeral and robust – comfortable but exciting to sleep in. The idea is that sleeping in the pod, is a transformative experience in its own right – a chance to spend a night in a human nest where you can see the movement of the wildlife below and hear the gurgling of the stream. At Nomadic Resorts, we have struggled with the physical footprint of a traditional hotel development since we created the company in 2011 – in many ways hotels often seem to destroy the nature that they aim to celebrate. Our team has been striving to find a symbiotic, harmonious relationship with the sites we develop. To achieve that, we need to find a compromise between durability and sustainability, environmental integrity and guest comfort – size was an important consideration in that discussion- it is the place not the space that is true luxury. For us our little Seedpod represents a major step in that quest – it shows that E. F. Schumacher was right: small is beautiful." The form of the structure was a critical consideration for the team - the natural shape of a seed is inherently aerodynamic: when their team of membrane engineers introduced the structure into their computer wind model it showed that using a small number of structural rings, combined with a new generation architectural fabric, the pod can resist wind speeds of 120kmh. In addition to its structural performance the pod can be erected on its own optional tripod and equipped with lighting, a ceiling fan, a cool box and a charging station for devices making it an ideal option for hiking trails, surf camps or silent safaris. "Seeds, by their very nature, are full of potential," claims Creative Director Olav Bruin "so we created a multifunctional interior that can easily be converted from a seating arrangement during the day into a sleeping arrangement during the night. This way we are utilising the full potential of the relatively compact space. Over the coming years we hope to see our seedpod family adapt, expand and evolve over the coming years." Maybe Lao Tzu was right "To see things in a seed, that is genius". Nomadic Resorts is an interdisciplinary design & project development company servicing the hospitality industry with offices in the Netherlands, Sri Lanka, Mauritius and South Africa. Using a holistic approach, we create sustainable resort and residential projects that fit organically into their natural surroundings as we believe that designs should serve as a bridge to connect nature, culture and people. Lima, Peru - 5 April 2019: Inkaterra, Peru 's leader in ecotourism and sustainable development, in alliance with AJE Group and the Municipality of Machu Picchu Pueblo, succeeded in making Machu Picchu the first destination in Peru and Latin America to manage most of its solid waste sustainably. Continuing with the initiatives for the conservation and environmental care of Machu Picchu, the public-private partnership presented the first Organic Waste Treatment Plant. Through pyrolysis (chemical decomposition at high temperatures in the absence of oxygen), this innovative technology processes seven tons of waste per day to generate bio-char, a natural fertiliser that will help with the reforestation of the Andean cloud forest and contribute to agricultural productivity in Machu Picchu. "The strategic alliance between Inkaterra, the AJE Group and the Municipality of Machu Picchu aims to make our Wonder be perceived as a sustainable destination and to turn it into an example of sustainable management for ecotourism worldwide. We have achieved to raise ecological awareness in the local community, which now segregates almost all waste from homes and establishments at its origin. Today, we present an innovative technology that will contribute to improve high-mountain traditional agriculture and to help restore the Andean cloud forest in Machu Picchu," added José Koechlin, Inkaterra ́s Founder and CEO, who conceived these groundbreaking projects. “Machu Picchu is established in a small, deep valley with access by foot or train,” stressed Mr. Koechlin. “Given that there is no space for traditional composting, we figured out an inventive solution for a reduced area, which will not generate any carbon emissions. 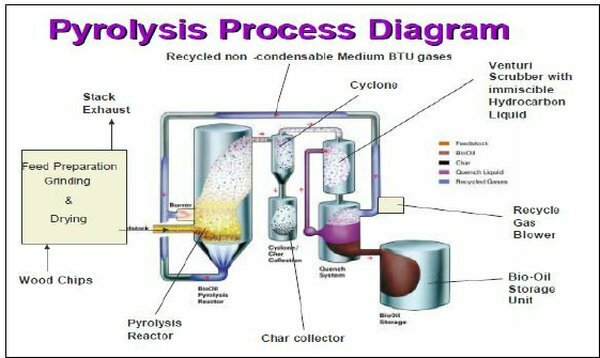 Pyrolysis to treat organic waste is a process with local usefulness, avoiding costs of transportation. The initiative is not only sustainable but also profitable for the Municipality, as the production cost in situ is lower than Bio-char’s market value”. AJE/Inkaterra delivered a Plastic Compactor Plant to SERNANP, which will be used to clean and compact plastic waste generated along the Inca Trail, the most famous trekking route in South America. The first initiative led by Inkaterra and AJE was carried out in 2017 when they donated and installed the first Plastic Waste Compactor Plant for the Municipality of Machu Picchu Pueblo. This action helped to prevent our World Wonder from entering UNESCO ́s Patrimony at Risk list. Currently, 14 tons of PET plastic are processed daily in this plant. In 2018, a Biodiesel Production Plant opened at Inkaterra Machu Picchu Pueblo Hotel. Through the collection of used cooking oil from Machu Picchu Pueblo ́s homes, lodges, hotels and restaurants, 20 gallons of biodiesel fuel are produced daily. Every month, six thousand litres of used oil are treated, preventing oil spillage into the Vilcanota River. It is estimated that one litre of oil pollutes one thousand litres of water. On the other hand, petro-chemical free glycerin obtained in this process is used by the Municipality of Machu Picchu to clean its sidewalks and stone floors. "We are very happy to be part of this change in the city of Machu Picchu and to be able to announce that, with this new plant, the circle of sustainability for which we have been working for three years is closing. Machu Picchu officially becomes a model of sustainability for Latin America," said Mr. Jorge López Dóriga, AJE Group ́s Executive Communications and Sustainability Director. In 2018, the project to turn the city of Machu Picchu into a model of global sustainability, won in Germany the prestigious “Die Goldene Palme” award in the "Responsible Tourism" category, as well as the Peruvian “Líderes + 1” prize. 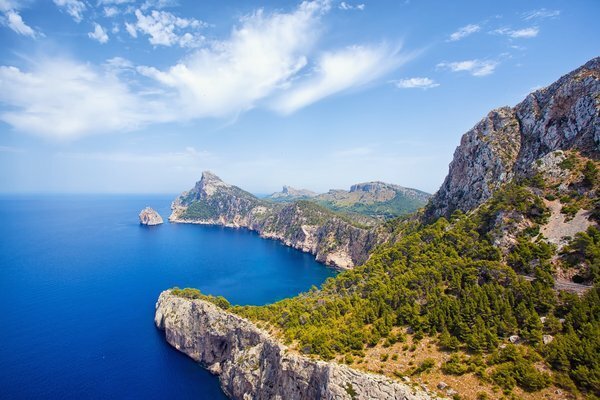 Madrid, Spain, 11 April 2019: Deploying new resources and actions for the progressive adaptation of the Balearic Islands (Mallorca, Menorca and Formentera) to the objectives of the 2030 Agenda, is one of the main objectives of the agreement signed between the World Tourism Organization (UNWTO) and the IMPULSA BALEARS Foundation. Its aim is to jumpstart the process of the strategic reformulation of tourism in order to make an effective contribution to sustainable development. 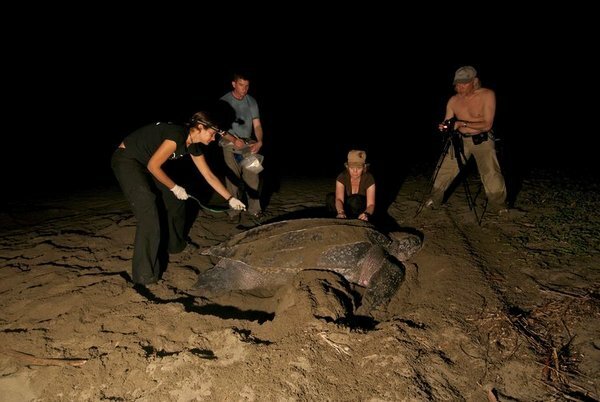 Beaverton OR, United States - 9 April 2019: The World Travel & Tourism Council announced SEE Turtles as the winner of the 2019 Changemakers Award at the Tourism for Tomorrow Awards ceremony. The Awards, now in their 15th year, took place at a special ceremony during the WTTC Global Summit in Seville, Spain, to celebrate inspirational, world-changing tourism initiatives from around the globe. Basseterre, St. Kitts - 8 April 2019: The St. Kitts Ministry of Tourism and the St. Kitts Tourism Authority are delighted to announce that St. Kitts and its Sustainable Development Council has won a prestigious Tourism for Tomorrow Award from the World Travel & Tourism Council (WTTC), presented at their Global Summit in Seville, Spain, April 3-4, 2019, headlined by keynote speaker Barack Obama. Taking home the Destination Stewardship Award for 2019, St. Kitts is now officially recognized as a global leader in sustainable tourism. Belize City, Belize - April 5, 2019: In a bold step for the sustainability of its fisheries and the world’s second largest barrier reef, the government of Belize has approved a plan to set aside 10% of its territorial waters as no-take marine protected areas (MPAs), tripling the size of its existing zones. “A healthy reef and vibrant fisheries sector is necessary for Belize to achieve its goals for reducing poverty, improving food security and nutrition and increasing investment for development in Belize,” according to Belize Fisheries Administrator, Beverly Wade. In 2016, in response to growing threats to the health of their fisheries, Belize established a nationwide secure fishing rights program, the first of its kind in the world. Belize’s approach creates incentives for fishing communities to become stewards of their fisheries. At the center of the solution being adopted by Belize is a combination of secure fishing rights and empowerment of fishermen called “Managed Access.” Under this approach, fishers and fishing communities control their own future through licenses, giving them access to fish in specific geographic areas of the fishery, and responsibilities to help manage the areas and observe regulations. Environmental Defense Fund (edf.org), a leading international nonprofit organization, creates transformational solutions to the most serious environmental problems. EDF links science, economics, law and innovative private-sector partnerships. 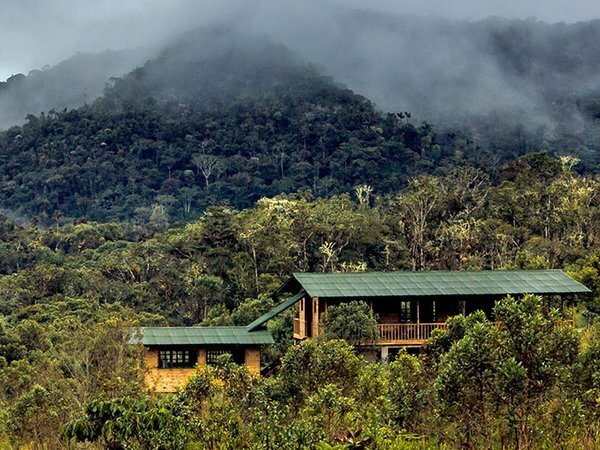 Athens, Greece - 2 April 2019: Ulcumano Ecolodge of Peru (Web: http://www.ulcumanoecolodge.com) has just been accepted as an Ecoclub Ecolodge™ following a transparent online audit procedure. Ulcumano has thus become the first Ecoclub Ecolodge in Peru and one of just 24 worldwide. Reacting to the good news the founder and proprietor of Ulcumano Ecolodge, Mr Eduardo De la cadena commented "We are really proud and happy for this! It took us 8 years to have everything in place to be able to receive a recognition like this one from Ecoclub. The project originated in my forestry engineer degree thesis and was influenced by the international ecotourism guidelines. Our team will keep on working for cloud forest conservation through Ulcumano, a life and living project, and this recognition will be very helpful!" Bristol, UK - 26 March 2019: A new report published today describes how destinations must uncover and account for tourism’s hidden costs or “invisible burden” so as to stop placing ecosystems, cultural wonders, and community life at increasing risk. Authored by Megan Epler Wood, Mark Milstein and Kathleen Ahamed-Broadhurst, this concise, 40-page study titled “Destinations at Risk: The Invisible Burden of Tourism" proves beyond reasonable doubt that the tourism industry's foundation 'will crack under its own weight' unless vital destination assets are protected and managed. Amid increasing concern about Overtourism, the report uncovers root causes for the problem and offers logical and integrated analysis of why it is transpiring, including the low ability of local government in both advanced and emerging economies. It argues that destination managers, businesses and experts must collaborate using science-based, data-driven analysis to create new local accounting systems that capture the full range of tourism costs, to build new skills and cross sector collaboration to achieve effective spatial planning, manage demand for public utilities, and evaluate the availability of local resources. Castries - March 4, 2019: The Month of March is expected to be a record-breaking period in Saint Lucia’s cruise sector. Between Friday March 1, and Sunday March 3, 2019, twelve (12) cruise vessels including the inaugural call of Crystal Esprit brought an estimated combined capacity of 19,052 travelers to the destination. Expected through March 31, is the arrival of an additional 125,434 travelers. In an effort to maximize the benefits of tourism locally that is in direct keeping with our current plans and policy trends toward sustainable cruise tourism strategies, special focus is being placed on the development and management of the cruise sector. Berlin - 6 March 2019: Guyana has been named the #1 “Best of Ecotourism” destination in the world. The award was presented to Guyana at the ITB global travel trade fair in Berlin, Germany. The second annual “Best of Top 100” Awards is a selection of the finest top 100 destinations selected by a panel of experts who reviewed sustainability success stories submitted by destinations worldwide. The newly created “Best of Ecotourism” category was added in 2019 and put Guyana up against very well-known and experienced ecotourism destinations like Sierra Gorda in Mexico, Tmatboey in Cambodia and the Galapagos Islands in Ecuador.